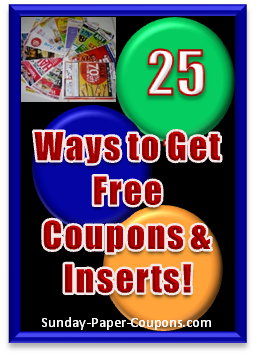 See below the list of ways to get extra Sunday Coupon Inserts for free, plus free printable grocery coupons, like the largest supplier of online coupons, the wildly popular Coupons.com and many more! 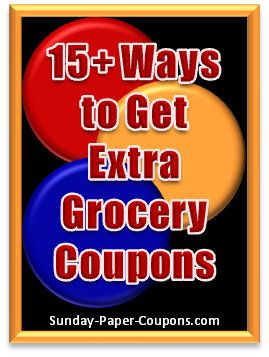 I highly recommend using Sunday Coupon Inserts, Printable Grocery Coupons, Electronic Coupons and Cash Back Coupons to save on groceries, since food is a needed an unavoidable expense. And, did you know that next to our Mortgage or Rent, Food is often the second largest monthly expense that we incur. But, you can put a huge dent in this expense with coupons. To achieve the best savings, you will need at least 2 Sunday Papers, and if you have a large family or wish to "extreme coupon," you will need even more than that. So, to assist you in getting additional Sunday coupon inserts, I’ve compiled this listing to show you how to get Sunday coupon inserts, including Free Ways and Low Cost Ways to Get Extra Sunday coupon inserts and Other Coupons, such as Free Printable Grocery Coupons, eCoupons and Store Coupons and Cash Back Coupons. Most Sundays, the paper will contain Sunday coupon inserts from SmartSource and Redplum, and the first Sunday of each month it will contain a third Sunday coupon insert from P&G-Proctor and Gamble. 1.) Ask Friends, Family, Neighbors, Co-workers, Church Members, etc. to give you their Sunday Coupon Inserts if they don’t use them. Since most people don’t use coupons (and don’t save the tons of money that we do) it shouldn’t be a problem. 2.) Ask your Newspaper Carrier if he/she might give you any extra Sunday Coupon Inserts on a weekly basis. 3.) High-rise buildings, multi-level Apartment Complexes, Condos, Elderly Complexes, Office Buildings, Hotels: Kindly ask the Manager if they have a recycling center at their trash disposal center, and if they’re willing to let you go through the paper recycle once a week and pick out the Sunday coupon inserts. This is one of the ways that my Mother use to get her inserts weekly in her own building, and she was able to get 20 to 100 of each insert per week! She mailed me and another family member (that are smart enough to coupon) a batch every 2 weeks, and I provided her with the postage to do so. 4.) Check Community Newspapers that are delivered to your door. Sometimes we simply throw these away, but some of them contain coupon inserts – so take a quick peek before you toss or recycle it. 5.) Contact your closest Recycling Centers and see if they will allow you to go through their bins before they separate the Sunday coupon inserts from the newspapers. 6.) Check Free Paper Stands that you find on sidewalks, at the entrance of Restaurants, Subway/Metro Stations, Grocery Stores, Bus Stops, Liquor Stores, Libraries, etc. They often contain free Community Newspapers that contain Redplum and SmartSource manufacturer’s inserts and local coupons. When you find the good Paper Stands, grab several papers (leave some for others though). 7.) Join or start a Coupon Train/Exchange, where you trade Sunday coupon inserts, and other coupons with fellow couponers – like family and friends, and their family and friends, etc. You can start by placing 30-50 coupons you won’t use in an envelope and mail it to the 1st person in the train, they’ll remove the coupons they like, then replace them with an equal or greater number of their coupons, then they’ll forward the envelope to the next person on the list (in the train) within 2 to 3 days, and the train continues until it gets back to you. Choo-choo… You might want to limit the number of people in your train, so that the envelope cycles back to you every 2-4 weeks or so. Each person removes the expired coupons. 8.) Grocery Stores, Convenience Stores, Gas Stations send back their unsold newspapers, and usually, the Sunday coupon inserts do not have to be included when these papers are returned. It never hurts to ask the Manager of these types of establishments if they’ll allow you to come and pull out the inserts. You’ll just have to be willing to come at whatever time of early morning or late evening they tell you to come. 9.) Some Libraries have a Coupon Donation Basket and people bring them in and drop the ones that they don't use. If your Library doesn't have one, you can ask if you can start one. It's a give and take system. Note: When you’re asking some of these people to assist you with obtaining additional Sunday coupon inserts, be certain to tell them that you not only keep these products for yourself and your family, but that you also donate many products (if you actually do). You’ll find that your generosity may also open the hearts of others, and they’ll be happier to assist you. Also, when you find people that help you achieve your goal of obtaining additional Sunday coupon inserts for free, give them a sincere thank you and/or reward them occasionally. Take your Family or Friends to lunch/dinner, give Family or Friends free products/food, give the Newspaper Carrier a tip or Gift Certificate, give the Managers a Fruit Basket, Gift Card or other little tokens of appreciation. 11.) Printable Manufacturer Coupons: Second to the Sunday coupon inserts, you will get most of your coupons via printable grocery coupons, like Coupons.com, SmartSource, RedPlum, P&G, Hopster and Common Kindness. With printable grocery coupons, you can usually print 2 coupons per computer. 12.) Free Coupon Apps: Coupon Apps like Checkout 51, SavingStar, ibotta and Snap by Groupon are yet another way to have access to free coupons. They do not require you to print any coupons, because everything is done online via your cell phone, tablet or computer. 13.) Catalinas: A long white coupon that prints from a machine near the Cash Register after a purchase, and is handed to you along with your receipt. 14.) Direct from Manufacturers: you can visit their website to find coupons, sign up for their newsletter, and/or email or write to them and tell them how much you like their product and many times they will send you coupons for free products or discount coupons. I've compiled a long listing of Manufacturer's and tell you how to get Coupons for Free Stuff and links to them for your use. 15.) Tearpads: A pad of Manufacturer’s Coupons that are placed near a product at a Store that you can tear off and take to the Cash Register to redeem. 16.) Peelies: Manufacturer coupons stuck on the actual product packaging in the store that you can peel off and use at check-out. 17.) Blinkies: Manufacturer coupons that can be found at stores in little boxes near products with red lights that blink. 18.) Wine Tags: Coupons found on the necks of Wine bottles. 19.) Magazines: Many Magazines, are now including coupons in their issues. 20.) Store Ads: Many store advertisements and sales contain either manufacturer or store specific coupons. Some stores also have monthly booklets available in their stores with manufacturer and store specific coupons in them as well. 21.) Home Mailers: You will receive these in your Mailbox, and they usually contain Fast Food or Restaurant coupons. 22.) On products: Look for coupons on products that you purchase. You will be able to cut them off of boxes of cereal, bags of frozen products, frozen pizzas, etc. Unlike peelies, you will only have access to these coupons after you’ve purchased, opened and/or used the item. 23.) With Free Samples: When you request Free Samples, many times a coupon will accompany that sample. 24.) Many Grocery Stores and Drug Stores also offer their own Printable or eCoupons. And, the great thing about these coupons is, because they are Store Brand Coupons, which means that they are not Manufacturer's Coupons, and they will have the Store's Name printed on them; they can usually be stacked (used in combination with) a Manufacturer's Coupon. This will provide you with double savings! For instance, Publix Grocery Stores also offer their own Electronic Coupons. You can go online and sign up. So, if Kraft Sliced Cheese was on sale for $2.89 and Publix was offering an Electronic Coupon for $2.00 off this cheese, plus I had a Manufacturer's Coupon for .75 cents off the same cheese, I could stack/use both coupons, and pay only .14 cents for this cheese! So, be certain to check the website of the stores you shop at to see if they offer their own store brand coupons! Even if they don't have any Store Brand coupons online, they often have them at the entrance of the store. To use Publix as an example again (and yes, I know that Publix is not available Nationwide), they have publications with Store Brand Coupons right at the entrance of their stores. CVS, Walgreens and Rite-Aid do as well. These coupons can also be stacked with Manufacturer's Coupons. Look for Store Brand Coupons in Newspapers and in your mail, because your local Grocery and Drugstores will also often mail these Store Brand Coupons to you! 25.) Since Cash Back Grocery Coupon Programs are relatively new, and many people don't yet know about them, and/or don't know how to use them, I wanted to tell you about them. We've all gotten use to paper coupons and these new-fangled ideas scare many of us, so we're slow to try them. Well, I don't want you to miss out on the savings, so I want to teach you how to use the newer ways to save, and most of the new Cash Back programs are really easy to use! Although Checkout 51 may be one of the easiest to use, there are several other great Cash Back Programs/Apps available, such as SavingStar, ibotta and Snap by Groupon. It's yet another way to save on groceries. We already had (1) Sales/BOGOs/etc., (2) Manufacturer's Coupons, (3) Store Coupons/Loyalty Cards; and now we have (4) Cash Back! It's truly a great thing! Keep in mind, this cash back savings is "in addition to" or "on top of" any money you save with sales and other coupons! Best of all, these are not additional coupons that you have to take to the grocery store and there's no stacking or match-ups involved. It's very easy. Some of the programs can only be used on your cell/mobile phone, and others, like Checkout 51 can be used on your computer, tablet or mobile phone. Plus, these cash back programs normally offer cash back for items that you almost never get regular coupons for, like: fruits, bread, vegetables, milk and eggs! So don't be skerd ☺, give them a try. I've also provided "How To Use" pages (see the left column) for these programs. 26.) If you don't feel like searching for your own coupon inserts and/or cutting your own coupons, you can always purchase your Sunday paper coupons or entire inserts from a convenience service that does the work for you. There are companies called Coupon Clipping Services that pre-clip coupons for you and ship only the coupons that you order or entire coupon inserts to you. 27.) Purchase one or multiple newspapers from discounters like DiscountedNewspapers.com. Enter your Zip Code to see if their rates are better than what you're now paying. 28.) If you haven't already, sign up for the 2 largest Daily Deal websites, Groupon and Living Social. They sometimes offer the major newspapers at SUBSTANTIAL discounts! I subscribed to a year at one of those specials and am getting 2 papers a week for less than the price of one if I had purchased it direct. Plus, I'm getting Thursday thru Sunday, instead of just the Sunday paper. It's a super deal, so sign up and keep your eyes open. And the best part is, when the 1yr daily deal subscription expired, I was able to negotiate directly with the newspaper to give me the same rate for additional years! I've been negotiating renewals at this discounted rate for years now! Simply tell them that if they're able to offer that rate through (insert Groupon or whomever) and still make a profit, then they should be able to make the same offer directly to you, and still make a profit! 29.) If you would like to purchase 10 or more Sunday Papers each week, ask to speak to the Sales Manager at your local Newspaper, and ask for a volume discount. You should be able to get the Sunday paper at a substantially lower price for this type of quantity. 30.) Buy coupons on eBay in groups. You're not actually buying the coupons, but you're paying the seller for their time (to cut the coupons) and supplies, like postage. It's illegal to re-sell coupons.